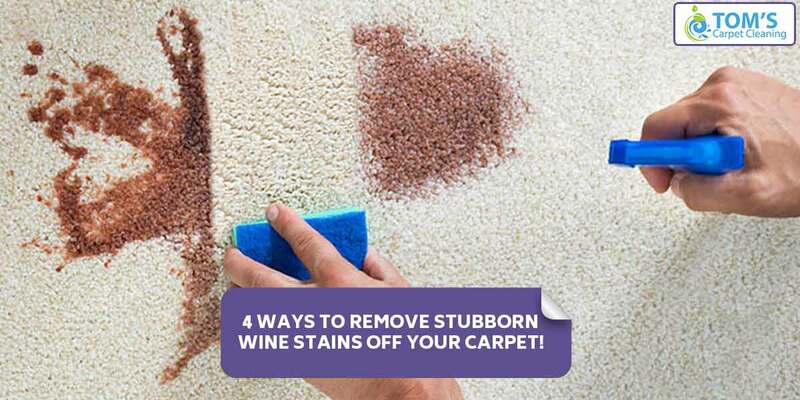 4 Ways To Remove Stubborn Wine Stains Off Your Carpet! We understand it was time for you to sit back and blow off some steam and carpet cleaning would be the last thing that you’d want to do. But anyway you got to act as fast as you can to remove stubborn wine stains before they set. If you can’t completely and effectively to a red wine spill during the party, blot up the spill as much as you can and then sprinkle a lot of table salt on the stain (make sure no one steps on it). Always blot, blot, and then blot again. Never rub red wine stained carpet. Scrubbing and rubbing will only bury the stains deeper in the carpet fabric. The best material for cleaning up any stain, especially a carpet one is a white terry towel. During absence of Terry towel, paper towels will do the job too. How To Remove Stubborn Wine Stains? Soda water is a classic homemade remedy for red wine stain carpet removal. The carbon dioxide lifts up the stain. After having moistened the stained with carbonated water (soda) blot the patch with a terry cloth. Do this several times until the purple red stain substantially fades away. Now dab a cloth into warm water+detergent solution. Pour some white wine on the red wine and blot away. The white wine neutralizes the staining constituents of the red wine and helps it lift off the carpet. Baking soda is not just a leavening agent. It contains in it salts which help the that makes stain removal much easier. Then apply a paste of 3 parts baking soda to 1 part water. Let the paste to dry and then vacuum up. Call in the professional carpet cleaning service providers. If you haven’t been successful in removing the red wine stain from the carpets call in the pros. Your carpets might require solvent-based cleaners, which is only used by professional carpet cleaning service provider. Use the first aid method and call the professionals. Toms professional carpet cleaning service providers offer you same day, onsite services, hire us by calling at 1300 068 194.